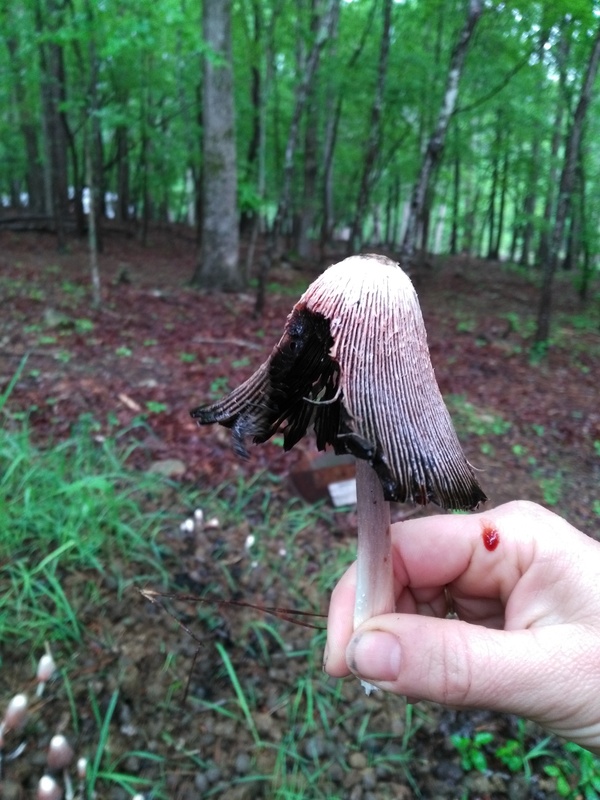 Last week we discovered mushrooms growing on a pile of horse manure out back. Laura identified the mushrooms as Coprinus comatus, or Shaggy Inky Caps, which are actually quite delicious, but have to be eaten immediately after harvested. So this morning I went out there and picked a bunch of mushrooms and fried them up in some butter with a little salt. 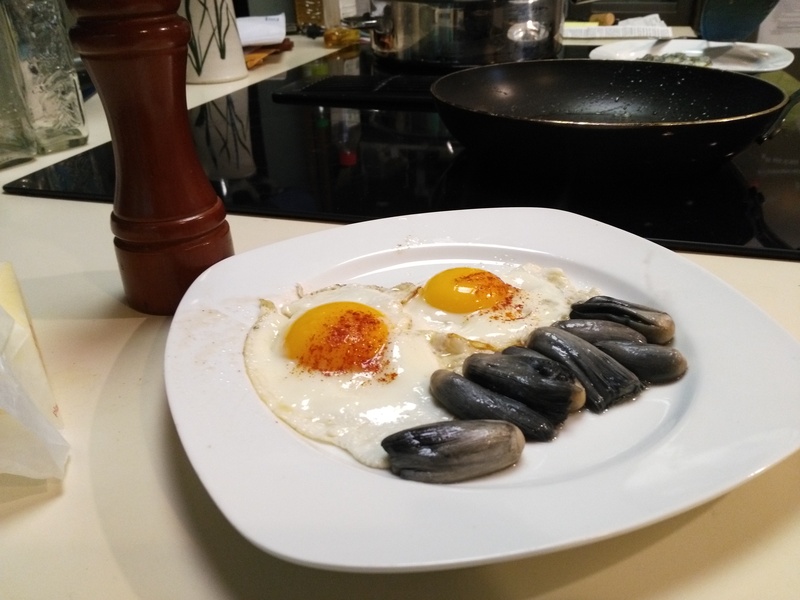 Then I fried a couple of eggs from our neighbor’s Bantam chickens to go with the mushrooms and had me a nice, locavore Sunday brunch :) … more below. D Letzte Woche entdeckten wir Pilze auf einem Misthaufen neben der Pferdeweide. 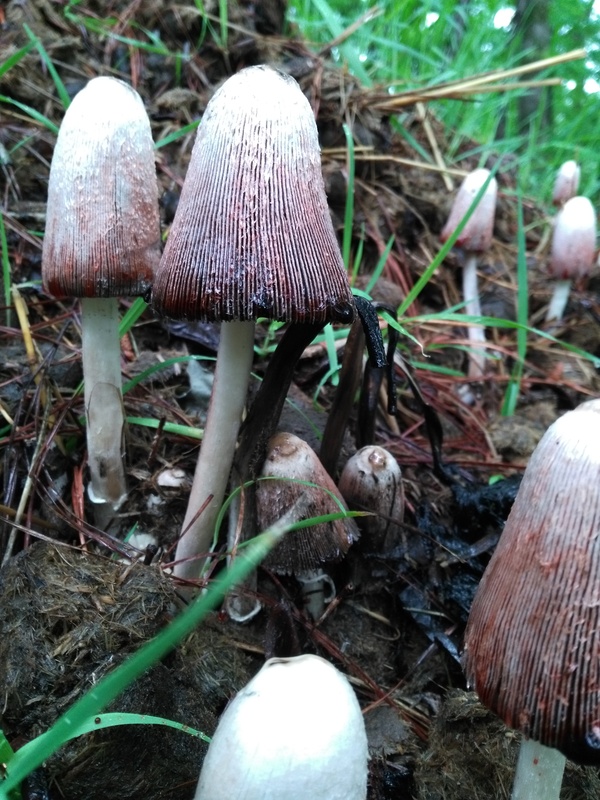 Laura identifizierte die Pilze als Schopf Tintlinge (Coprinus comatus) und die sind ziemlich lecker, müssen aber sofort gegessen werden wenn sie geerntet sind. Also ging ich heute morgen raus und erntete einige der Pilze und bereitete sie in etwas Butter und Salz zu. Dazu kam noch ein paar Spiegeleier von den Hühnern des Nachbarn, und damit hatte ich ein wunderbares Sonntagsbrunch. Shaggy Ink Caps are very interesting fungi. They are common all over the northern hemisphere and they are very tasty, but they dissolve into a black goo within a couple of hours after they are harvested. On the pictures below you can see mature specimens that have started to form the black goo that contains the spores. If you want to eat them, it’s best to harvest them when they are young and still have very short stems. This entry was posted on Sunday, April 23rd, 2017 at 1:56 pm	and is filed under Deutsch, flavors, Mother Earth. You can follow any responses to this entry through the RSS 2.0 feed. You can skip to the end and leave a response. Pinging is currently not allowed.